Royce Freeman and Marcus Mariota have been the talk of the sports world leading up to the first college football semi-playoff game. The Ducks’ offense thrives on being able to run the ball in order to control the pace of the game as well as keep pressure off of Mariota. However it is the receivers that are going to do the work downfield that makes Mariota’s arm so dangerous. Tyson Alger of The Oregonian showed the shift Oregon has made from an unproven, uncertain group of receivers to possibly the deepest, most talented group in the country. Leading the way with 61 receptions and 814 yards has been Byron Marshall, a converted running back who rushed for over 1,000 yards last season. Marshall’s flexibility and willingness to adapt to play wherever he is asked gives the Ducks a weapon all over the field. Track star Devon Allen seemed to be unstoppable during the first half of the season when he scored six touchdowns in the Ducks first six games. Allen is currently leading the Ducks’ receiving corps with seven touchdowns as well as the longest reception of the season, an 80-yard touchdown pass against Washington State. Rounding out the top three receivers for Oregon is Sophomore Dwayne Stanford who has brought in 37 passes for 557 yards and six touchdowns. Stanford had his best game of the season in October in the shootout with Cal when he had 103 yards and two touchdowns. This talented group will have their work cut out for them against a hungry, experienced FSU secondary. Allowing 218.2 passing yards per game this season, the Seminoles have settled in as of late and have allowed an average of only 184 over their last five games. Florida State has been successful keeping teams out of the end zone as well, allowing only 23 points per game. 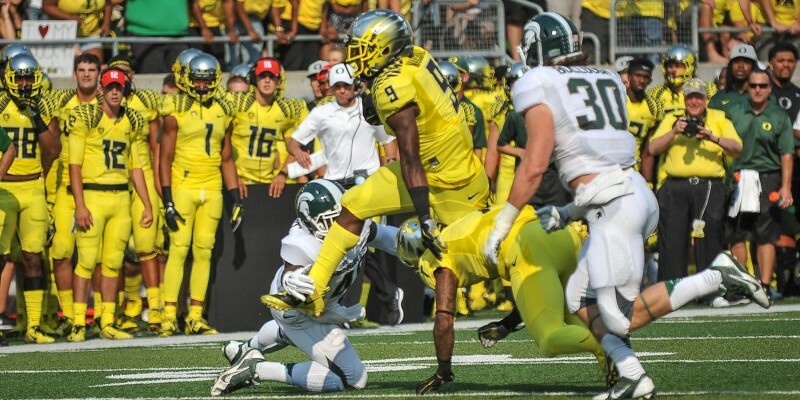 While FSU has improved in recent games, Mariota and the Ducks present a whole new challenge. Oregon has averaged 308.9 passing yards per game (11th) and 46.3 points per game (3rd). The Ducks are confident in their playmakers, from veteran leaders such as Mariota and Marshall to fresh and exciting underclassmen Allen, Stanford and Charles Nelson ready to make their mark. Watch to see a balanced attack, sure to highlight many a Duck on New Year’s Day.